Sparkling Beverage with Orange juice from concentrate (11%) and Pomegranate from concentrate (5%), with other natural flavors, sugar and sweeteners. Enjoy the citrusy taste of the Italian sunshine. 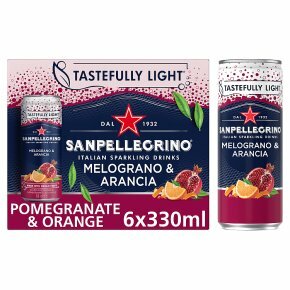 SANPELLEGRINO Melograno e Arancia (Pomengranate & Orange) is a sparkling fruit beverage made with the juices of delicious oranges and pomegranate, offering a fresh, tart taste with a sweet finish.